Can I Recover from the Insurance Company When Diagnosed with Spondylosis After a Car Accident? Spondylosis or spondylolisthesis is a degenerative condition in the spine compromising the cushions between the spinal disks and the joints between the bones of the spine. When these discs are compromised, the bones of the spine lose their place, sometimes pressing on the nerve, which can cause an auto accident victim a great deal of pain. In essence, the shock absorbers of the spine are compromised. If you have spondylolisthesis and are injured in a car accident, an "injury" that you did not even know you had can become life altering. What Are the Most Common Spondylosis Related Complaints in Car Accident Cases? Spondylosis can affect any disc. Typically, our lawyers see a disproportionate number of cases of lumbar (back) spondylolisthesis at L4 and L5 that contribute to our clients’ pain from a car accident. We also see cervical (neck) spondylolisthesis, most frequently at C4, C5, and C6. How Do You Know If you Have Spondylosis? 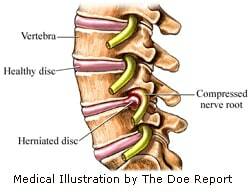 Sometimes a neck or back x-ray will show that the vertebra is out of place and that a disc is degenerating. More often, a CT scan or MRI is ordered to provide the detailed disc images needed to confirm the diagnosis and understand the scope of the spondylosis. Typically, spondylolisthesis is degenerative, which means your discs are wearing down as a result of the aging process, and the toll physical exertion takes on your spine. Does This Mean Spondylolisthesis Is Not a Part of My Accident Claim? Can a car accident cause spondylosis? No, your car accident cannot cause spondylolisthesis. But what an auto accident will do is take an "injury" where the person has no pain or symptoms and turn it into a life altering accident. This is the critical point. Spondylosis patients may have no symptoms until the accident, but because of this latent preexisting injury, they cannot heal quickly or fully from their injuries in spite of treatment. So, sure, perhaps the injury would not have been as severe had the person not had spondylosis. But that does not absolve the defendant from compensating the victim for the harm that was caused. Said differently, if someone rear-ends you and you have eggs in the back of your car, it is not a viable defense to argue that the eggs could have just as easily been golf balls. In law school, the torts professor describes this as taking the plaintiff as you find them. How Does the Law Treat Spondylolisthesis in Car Accident Cases? Actually, in the abstract, the trial value or settlement formula in spondylolisthesis cases is quite simple: you are entitled to recover for the medical treatment, lost wages and pain and suffering you had that you would not have had but for the accident. What does that mean? It means you are entitled to the damages you have suffered as a result of an accident. For example, your preexisting injury – say spondylosis, in this case, causes you to have a pain level in your back of 2. As a result of the crash, your pain level has now risen to 7. Your compensation from the accident is the medical treatment, lost wages, and pain and suffering, not for the pain level of 7, but for the difference between the pain level of 2 and 7. There are two Maryland jury instructions that underscore this: the susceptibility instruction (Maryland Pattern Jury Instruction 10:3) and aggravation of preexisting condition instruction (Maryland Pattern Jury Instruction 10:4). But while the settlement formula itself is easy, the application of the formula is where the battleground is fought in spondylosis or any other preexisting injury cases. Typically, our accident lawyers are going to argue – usually supported by the treating doctors, which is almost invariably the situation if we have accepted the case – that the plaintiff’s suffering was caused either wholly or partially by the car accident. The insurance companies’ doctors argue that the plaintiff was already in pain before the accident and that their condition made them, essentially, a ticking time bomb. The key is having a lawyer who can plainly articulate the difference between your condition before the accident and your current physical condition. Illinois, 2013: $2,386,000 Verdict. A 59-year-old truck driver is parked and asleep in the sleeper berth of his truck when his truck is struck in the front corner by another truck. Plaintiff’s MRI revealed two degenerative conditions in his lower back, spondylosis at L3-4 and stenosis at L4-5, requiring injections, physical therapy, and eventually two fusions. Plaintiff sues the driver and his employer. Defendant disputes the nature and extent of the accident and that the “jostling” could not have been nearly as severe as Plaintiff claims. Plaintiff asks for $3.85 million for medical bills, pain and suffering, and loss of normal life. After deliberating for 2 & frac12; hours, the jury awards Plaintiff $2,386,000. 2014, Illinois: $41,608 Verdict. Plaintiff, a 28-year-old network consulting engineer was struck on the passenger side while making a left-hand turn. Plaintiff declined treatment at the scene, but later sought treatment for neck and back pain. An MRI months later revealed a C5-6 herniation. Plaintiff received off and on physical therapy for two years. Plaintiff filed suit and asked for $80,000 which included $20,633.06 in past medical specials. Plaintiff’s expert testified that the herniation found could have been caused directly by the accident, or was at least an aggravation of a previous degenerative condition. The defense disputed the Plaintiff’s allegations and contended that the herniation occurred before the accident and was not further aggravated by the collision in question. The defense further contended that the Plaintiff was entitled to $754 in meds for his initial hospital bill and some brief follow-up treatment, and no more than $5,000 in pain and suffering. The jury found the Plaintiff’s story a bit more plausible and awarded $16,608 in meds, and $25,000 in pain and suffering, for a total verdict of $41,608. The liability carrier in this matter was State Farm. If you have a neck or back injury you believe has been largely or wholly caused by an auto accident, call us at 800-553-8082 or 410-779-4600 or get a free online case consultation.